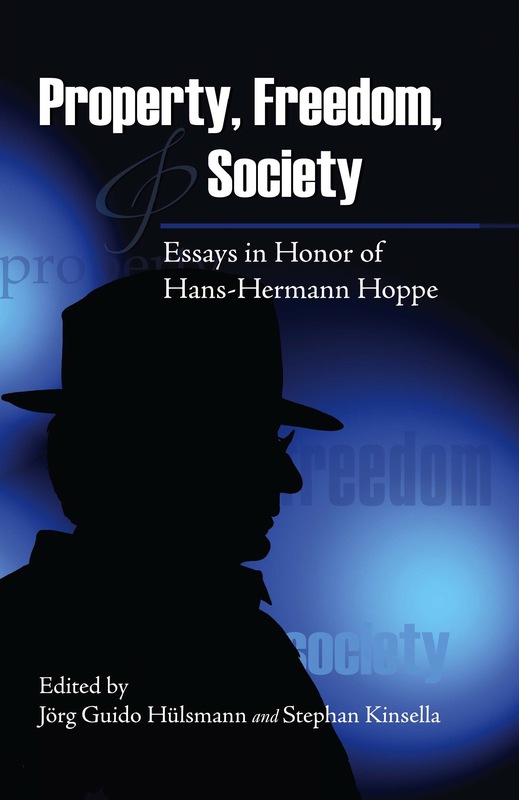 Today the Mises Institute announces the publication of Property, Freedom, and Society: Essays in Honor of Hans-Hermann Hoppe, edited by Jörg Guido Hülsmann & Stephan Kinsella. Hans-Hermann Hoppe is one of the most important scholars of our time. He has made pioneering contributions to sociology, economics, philosophy, and history. His important books include Handeln und Erkennen (1976), Kritik der Kausalwissenschaftlichen Sozialforschung (1983), Eigentum, Anarchie, und Staat (1987), A Theory of Socialism and Capitalism (1989), The Economics and Ethics of Private Property (1993, enlarged 2nd edition 2006), Democracy—The God That Failed (2001), and The Myth of National Defense (editor, 2003). He is the founder and president of the international Property and Freedom Society, which promotes scientific debate in combination with intransigent libertarian radicalism. 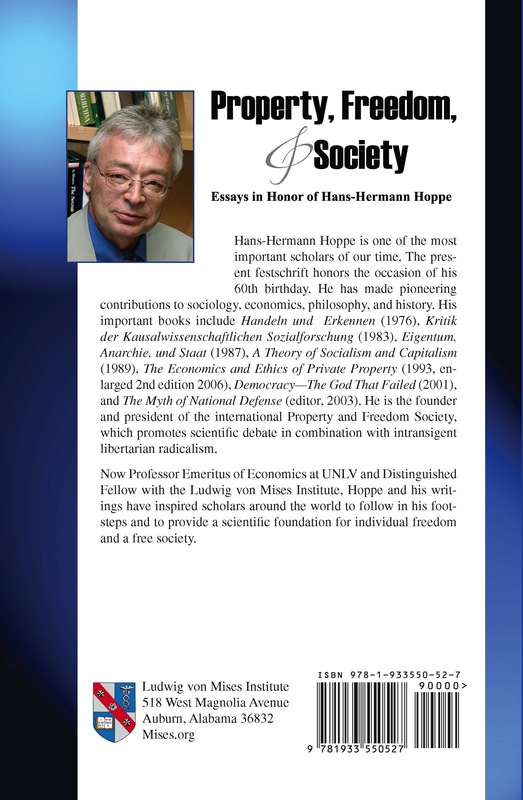 Now Professor Emeritus of Economics at UNLV and Distinguished Fellow with the Ludwig von Mises Institute, Hoppe and his writings have inspired scholars around the world to follow in his footsteps and to provide a scientific foundation for individual freedom and a free society. The present festschrift honors the occasion of his 60th birthday. The festschrift contains personal testimonies and essays in Professor Hoppe’s preferred research areas, such as political philosophy, democracy, and economics. The contributors are colleagues, collaborators, and former students from all over the world, including Llewellyn H. Rockwell, Sean Gabb, Jesús Huerta de Soto, Robert Higgs, Frank van Dun, Paul Gottfried, Joseph T. Salerno, Walter Block, and Thomas J. DiLorenzo. The Festschrift was presented to Professor Hoppe at a private ceremony on July 29, 2009, in Auburn, AL during Mises University 2009. This 400+-page, 35-chapter book is available for purchase at the Mises Store (and Amazon) and also as a free PDF download [local copy] [and epub]. (My own contribution is chapter 20, “What Libertarianism Is.”) The contents are listed below. 1. A Life of Ideas – Llewellyn H. Rockwell, Jr. I need this and all books in Audible, but $2.99 on Kindle will work for me. Next post: Brad Edmonds’s There’s A Government In Your Soup — Now Online! Bad Behavior has blocked 5410 access attempts in the last 7 days.